A decade on, Oliver Frljic is still challenging theatre audiences across Europe, as well as in the Balkans, using plays to confront the nationalist mythology of post-Yugoslav societies. Read more. As Serbia opens new EU chapters, Serbia’s chief EU negotiator, Tanja Miscevic, warns that Belgrade will eventually have to revise all its current bilateral trade agreements, including with Russia. Read more. Romania’s biggest protests since the fall of communism have brought a new generation of journalists - inspired by US-style fact-checking activists - to the fore. Read more. A delegation of the International Monetary Fund, IMF, will begin a seven-day official visit to Serbia on Monday during which it will conduct a precautionary inspection of the implementation of the current three-year arrangement, the Belgrade office of the IMF confirmed to Beta news agency. Under the 1.2-billion-euro IMF agreement, which was reached with Serbia in February 2015, the Serbian government made a commitment to implement fiscal consolidation and restructure the public sector, Beta reported. During its last revision in October 2015, the IMF concluded that Serbia achieved fiscal stability, but should continue with structural reforms. It is expected that the Serbian government will consider the possibility of concluding a new agreement with the IMF, Beta reported today. MPs from Serbian List, the main party representing Serbs in Kosovo, will end their boycott of Kosovo Parliament as soon as the formation of the Association of Serbian Municipalities begins, Deputy Prime Minister of Kosovo and Serbian List member Branimir Stojanovic told media on Monday. "Our crucial requirement is the start of the formation of the Association of Serbian Municipalities, then we can go back to [Kosovo] institutions,” Stojanovic told Serbia’s national broadcaster RTS. “We need to stick to what was agreed in Brussels," he added. Dialogue between Belgrade and Pristina aimed at normalising relations has decreased and both sides need to respect agreements that have so far been reached between them, the UN Secretary-General Antonio Guterres wrote in his report on the United Nations Mission in Kosovo, UNMiK, which will be discussed on Monday. "The loss of momentum increases the risk that the process of normalization, which is in the interest of both sides, could potentially regress," Guterres said. 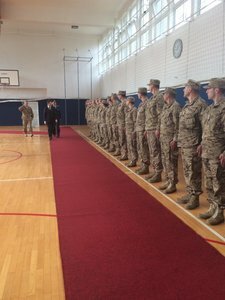 The Secretary-General also claimed that the tendency of Serbia and Kosovo to turn minor problems into major disputes in order to achieve a tactical advantage against the other has contributed to the deterioration in relations. Thousands protested in the Romanian capital Bucharest on Sunday against the Social Democrat government after it tried to weaken a crackdown on corruption earlier this month. At 10pm, protesters raised pieces of blue and yellow paper above their heads and lit them with mobile phones to form a giant European Union flag. At previous protests this month, demonstrators used the same technique to form the Romanian flag. While the number of protesters has decreased since early February, when an estimated 500,000 people swarmed onto the streets, between 3,000 and 5,000 people gathered outside the government headquarters on Sunday demanding the resignation of the government which they say they cannot trust. Many of the protesters were carrying pins that read "#Resist". 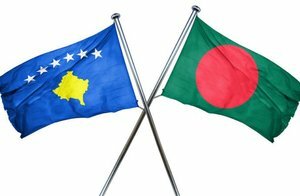 Bangladesh has become the 114th country to recognise Kosovo as an independent country on Monday. “Happy to announce that Bangladesh has recognized Kosovo as independent country. Thanks to the Government and people of Bangladesh,” Kosovo’s foreign minister Enver Hoxhaj wrote on Twitter following the announcement. Singapore was the last country to recognise Kosovo as a sovereign state, doing so on December 1, 2016. The Kosovo Special Prosecution has indicted an imam of the Grand Mosque of Pristina, Shefqet Krasniqi, on criminal charges “inciting terror activities”, “inciting hatred” and “tax evasion”, Gazeta Express reported on Monday. A press release issued on Monday said that the indictment has been filed at the Basic Court of Pristina against Krasniqi on criminal charges including inciting terror activities, inciting national, racial and religious intolerance, and tax evasion. According to the indictment, Krasniqi with his lectures has encouraged others to join armed conflicts in Syria and Iraq, and carry out terrorist attacks. Serbia opened two more chapters in its negotiations on EU accession on Monday at the Intergovernmental Conference in Brussels. Serbia now has chapter 20 on entrepreneurship and industrial policy and chapter 26 on culture and education opened. The Commissioner for European Neighborhood Policy and Enlargement Negotiations, Johannes Hahn, posted on Twitter that he is glad that Serbia has moved forward in its EU accession talks. “EU perspective is firm and real. 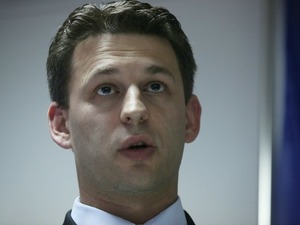 Reforms will benefit young people and business,” Hahn wrote. Serbia has now opened eight of the 35 chapters as part of the negotiation process which began in January 2014. Albanian ruling coalition MP Armando Prenga gave up his mandate on Monday after the General Prosecutor asked the Albanian Electoral Commission, CEC, to remove it as result of not declaring a past court ruling against him on document falsifications. Prenga announced he would be stepping down in a letter sent to the chairman of the Parliament, Ilir Meta. CEC had previously decided to not remove Prenga’s mandate, claiming there was insufficient proof against him, Prenga wrote in his letter that he was resigning for the sake of his family tranquility. Romanian anti-graft prosecutors claimed on Monday that the Ministry of Justice destroyed and forged official documents in order to pass a controversial decree relaxing anti-corruption legislation that brought hundreds of thousands of people onto the streets in mass protest. After a local NGO filed a complaint against the cabinet, Romania’s anti-corruption watchdog DNA started to probe two weeks ago the way the decree was adopted. Several ministers and state secretaries have been questioned. According to the DNA investigation, a document sent by the Ministry for Parliament Relations where specialists made several amendments to it was destroyed at the Ministry of Justice and replaced with a forged document that validated the draft. The prosecutors also say that the Ministry of Foreign Affairs did not study the bill and the minister approved the decree on the spot, without reading it, at the government meeting. The investigation concluded that there was no interference from the Social Democrat Party chief Liviu Dragnea, who was accused of pushing for the decree to be adopted, and so there can be no corruption-related charge. However, the Prosecutor’s Office at the Supreme Court will continue the investigation. Bosnia’s Foreign Affairs Minister Igor Crnadak said on Sunday that the Hague-based International Court of Justice has sent letters to each of the three members of the country’s tripartite residency, which arrived at the Bosnian Embassy in the Netherlands on Friday. Croat presidency member Dragan Covic said the letters are probably asking the presidency to express its stance on the proposed review of Bosnia’s genocide case against Serbia, which has called a political storm in the country, and that the presidency should answer unanimously. Crnadak said the letters will arrive at his ministry “at the latest” on Tuesday. It is not known when the contents will be made public. Bulgaria’s two main parties are entering the electoral campaign for the early parliamentary vote in March with very close results, the latest poll of Alpha Research, revealed on Monday, shows. The centre-right GERB, headed by ex-PM Boyko Borissov, is leading with the confidence of 31.5 per cent of the people who took part in the poll, closely followed by the Bulgarian Socialist Party. Pollsters have reported a relatively high readiness – 66 per cent - among Bulgarians to take part in the vote, scheduled for March 26. Ivan Vrdoljak, president of the centre-left Croatian People's Party, HNS, said on Monday that the interior ministry and the government are to be blamed for not banning Sunday's march in Zagreb, organised by a marginal Croatian far-right party, at which a German neo-Nazi party’s flag was flown. Vrdoljak concluded that Nazis and fascists should be put in prison, where they should be educated, so that "the same [plan] never crosses their minds". Over 3,400 employers did not pay our wages for a combined 10,670 of their workers in 2016, the Croatian tax administration stated on Tuesday. President of Republika Srpska Milorad Dodik has announced that on Wednesday, he will be traveling to a meeting in Moscow rather than meeting with the EU High Representative for Foreign and Security Policy Federica Mogherini, who will be visiting Bosnia and Herzegovina. He told RTRS that his trip to Moscow was arranged a month ago and cannot be canceled. Dodik expressed regret that he will not be able to talk to Mogherini and added that the interests of his party, the SNSD, will be represented by party vice-president Zeljka Cvijanovic. 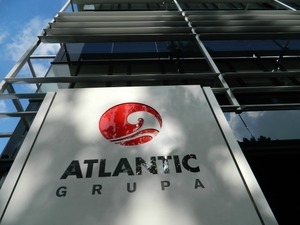 Croatian food company Atlantic Group, one of the leading companies in the region and employing 5,000 people, announced that its revenue in 2016 was 686.7 million euros - 5.5 per less than in 2015. Additionally, Atlantic's earnings before interest, taxes, depreciation and amortisation, EBITDA, were 63.8 million euros in 2016, representing a 16.4 per cent annual decline, which the company says is due to investment in the distribution of its products in Austria and Germany. The company's net profit was 21.9 million euros, a decline of 22.9 per cent over the year. The Association of Independent Journalist in Serbia, NUNS, will file a complaint to the European Federation of Journalists against Serbian Prime Minister Aleksandar Vucic for alleged inappropriate behaviour against journalists, NUNS secretary general Svetozar Rakovic told media on Tuesday. Rakovic highlighted a recent incident in the southern Serbian city of Nis on February 24 when Vucic accused journalists of biased behaviour, supporting opposition candidates in the upcoming presidential elections and of rudely interrupting him. Vucic’s accusations against the journalists came after they questioned him about not fulfilling his election promises towards workers of state companies from Nis, many of who are still owed wages. Rakic stated that this kind of behaviour from the prime minister should be interpreted as political pressure on journalists. The International Court of Justice, ICJ, in The Hague requested clarification from the Bosniak member of Bosnia’s tripartite presidency, Bakir Izetbegovic, on the legitimacy of Bosnia’s legal counsel Sakib Softic as the country’s agent at the court, it was revealed on Monday evening. Izetbegovic told media of the request, which he had received in a letter sent to him from the court last week, with the Croat and Bosniak members of the presidency also receiving their own letters from the court – although their contents have not been revealed. According to Izetbegovic, the letters were sent due to confusion that arose regarding Softic's legitimacy after Serb Presidency member Mladen Ivanic and foreign minister Igor Crnadak had earlier sent private correspondence to the ICJ. Softic filed a request to court last Thursday for an appeal against the 2007 International Court of Justice verdict clearing Serbia of direct responsibility for genocide during the 1992-95 war. 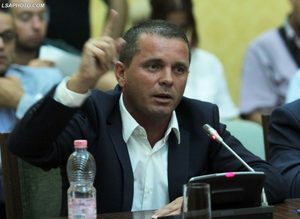 Meanwhile, Momcilo Novakovic, an MP from the National Democratic Movement, NDP, stated that the legal team of the Alliance for Change (the main opposition bloc in RS which is a part of the ruling coalition at the state level with other Bosniak and Croat parties) is preparing criminal charges against Softic for wrongly acting as Bosnia's agent at the ICJ. Croatia's GDP grew for 2.9 per cent in 2016 on the annual level, according to the first estimates from the Croatian Bureau of Statistics, reported on Tuesday. This is the biggest annual GDP growth for the country since 2007, when Croatia’s economy grew by 5.2 per cent at the annual level. Serbian Prime Minister Aleksandar Vucic would win the presidential election in the first round with 52.3 per cent of the votes, while liberal candidate and former Ombudsman Sasa Jankovic would get 13.9 per cent of votes, just 0.6 per cent more than former UN secretary general candidate Vuk Jeremic, according to the latest research by marketing agency Ipsos for Blic daily. The agency's results also showed that Serbian Radical Party leader Vojislav Seselj could gain 11 per cent of votes in the upcoming election for president. According to Ipsos' director, Marko Uljarevic, more relevant data will be able to be provided once the Enough is Enough party, led by Sasa Radulovic, decides on who is going to be their candidate in the presidential race. 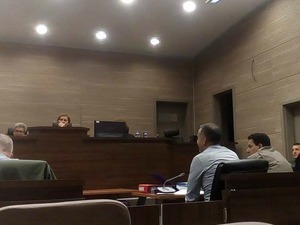 The Basic Court in Pristina decided on Tuesday to release alleged Balkan drug boss Naser Kemendi from jail and put him under house arrest. Kelmendi, whose trial started in January 2015, is charged with aggravated murder, two counts of organized crime and six counts of the sale and production of drugs in various capacities, which include managing and overseeing a narcotics ring. The most high-profile charge in the case concerns the 2007 murder of notorious Sarajevo gangster Ramiz Delalic, also known as Celo. Kelmendi, a Kosovo Albanian with Bosnian citizenship, was wanted on an international arrest warrant and arrested in Pristina in May 2013. MEPs welcomed recent progress in normalizing relations between them following a sharp rise in tensions that had put the implementation of key Pristina-Belgrade agreements on hold, and passed two resolutions urging both sides to show more commitment to achieving this goal, the European Parliament stated in a press release on Tuesday. The resolution on Serbia welcomed Monday’s opening of two new chapters on EU accession and called on the country to align its foreign policy with that of the EU, including its policy on Russia. “In 2017, Serbia should continue to put special emphasis on strengthening the rule of law, as corruption and organised crime still represent an obstacle to the country’s democratic, social and economic development," said European Parliament rapporteur David McAllister. For Kosovo, rapporteur Ulrike Lunacek stated that "Today’s vote [on the resolution] again sends a strong signal that the future of an independent Kosovo lies in the European Union. With only a few steps to go on the way to visa liberalisation, the report encourages all political parties in Kosovo to continue their work for Kosovo in a constructive manner and European spirit." MEPs also highlighted that five EU countries still do not recognise Kosovo as an independent state and urge them to do so to increase the EU’s credibility in its external policy and to aid the Pristina-Belgrade dialogue, according to the EP’s press release. Bozo Petrov, chair of the Croatian parliament and president of junior government party Bridge of the Independent Lists, MOST, praised his party's role on Tuesday in the government’s decision not to increase gas prices from April onwards. Croatian Prime Minister Andrej Plenkovic announced the decision to daily Jutarnji list on Tuesday afternoon. Following this, Petrov wrote on Facebook that the government had to think about the living standard of citizens when setting the gas price, as well as the business of state gas companies. He concluded that this is yet another success for "MOST's team" in the coalition government. The Serb member of Bosnia's tripartite presidency, Mladen Ivanic, has accused "parallel government structures" loyal to Bosniak Presidency member Bakir Izetbegovic of opening a letter addressed to him from the International Court of Justice, ICJ, in The Hague before he received it. Ivanic told media on Tuesday that “I now know how Izetbegovic got this letter earlier", adding that he had specifically asked earlier for the letter not to be opened before he received it. He also confirmed that his letter contained the same message that Izetbegovic had earlier revealed he had received in his own letter from the ICJ - a request for clarification on the legitimacy of Bosnia’s legal counsel Sakib Softic. Softic submitted a request on Thursday for a review of the 2007 judgment in the lawsuit in which Bosnia attempted to sue Serbia for genocide in Bosnia during the war of 1992 to 1995. The Serb, Bosniak and Croat members of the presidency all received letters from the ICJ, but the Croat member, Dragan Covic, is yet to reveal what his contained. Croatian President Kolinda Grabar Kitarovic said marginal movements, such as the far-right Autochthonous Croatian Party of Right, A-HSP, which organised Sunday’s march in Zagreb in support of US President Donald Trump - and at which a German neo-Nazi party’s flag was flown - should not be given too much attention, because "then we give them what they want". She explained that by giving such groups prominent attention, it creates an image that Croatia is more intolerant than it really is and incites hate. Grabar Kitarovic said that isolated cases such as the march in Zagreb should be prevented, while also emphasising that no parliamentarian party has a political programme that supports the Ustasa ideology and Nazism displayed at the rally and that citizens condemn such events. Presidential elections in Serbia will be scheduled for April 2, the Prime Minister’s office confirmed on Tuesday after B92 reported the news. The president of the Serbian Parliament, Marija Gojkovic, will call the elections officially on Thursday, Serbian media reported. At least 20 people have been injured in an explosion at the Technical Repair Bureau in the Serbian city of Kragujevac on Tuesday, public broadcaster RTS reported. Forty firefighters, soldiers and employees of the Bureau are currently working to put out the fire that was caused by the explosion, according to RTS. The first blast occurred at 1:20pm and was followed soon after by another. According to news reports, the force of the explosions was so strong it shook house windows in the city and was widely heard by citizens. The Serbian defence ministry published a press releace confirming that there are injured people, but didn't specify how many. It added that the defence minister and his assistant went to the scene. After Monday's protest rally in Macedonia's capital Skopje, more demonstrations by supporters of the former ruling party, VMRO DPMNE, have been scheduled for Tuesday afternoon. The protests will take place in Skopje and in several towns including Bitola, Prilep, Kicevo and Stip. 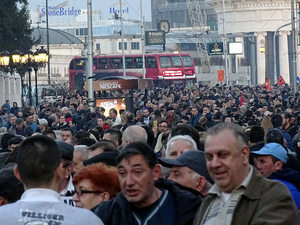 The protest organisers, the newly formed Civic Initiative for a United Macedonia, insist however that no single political party supports their rallies and claim they will continue protesting until all politicians pledge not to breach the Constitution and not to change the country's name, which is the subject of a long-time dispute with neighboring Greece. Several thousand people rallied in the capital on Monday against the formation of a new opposition-led coalition government which they claim endangers Macedonian national interests. Demonstrators accuse the Social Democrats, SDSM, and its leader Zoran Zaev, of betraying Macedonia’s interests by striking a deal on a number of ethnic Albania demands in return for support to form a new coalition government following the December 11 general election. One person was killed and 25 were injured on Tuesday by an explosion at a military repair depot in the Serbian town of Kragujevac, the defence ministry said. A search for another three missing workers was continuing, the statement said. Macedonian cameraman Vladimir Zelceski and journalist Aleksandar Todevski from news portal A1on were physically attacked at tonight's protest attended by supporters of the former ruling VMRO DPMNE party in Macedonia's capital, Skopje, against the formation of a new opposition-led coalition government which they claim endangers the country's national interests. "Participants at the protest had attacked the reporters from behind, throwing punches towards their heads and kicking them. They have taken their camera, thrown it to the ground and started kicking it, managing to completely destroy it," A1on editor-in-chief Predrag Petrovic said. "Medical emergency [workers] have been called right away and at the moment the two reporters are at the urgent medical centre where they are being examined." Some of the nearby photo reporters managed to take pictures of the alleged attackers leaving the spot, and of the two reporters lying on the ground. 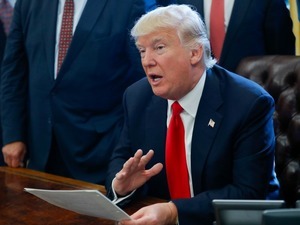 The United States calls on Macedonia’s leaders to form a new government without further delay, in a manner consistent with the constitution and Macedonia’s aspirations to join the European Union and NATO. The formation of a new government committed to rule of law and implementing needed reforms will help end a political crisis that has severely hindered the country’s democratic and economic development and Euro-Atlantic integration. The United States urges all parties to put the interest of Macedonia and its citizens above all else, to work together constructively, and to fully implement all of their commitments under the Przino agreement. The EU's foreign policy chief, Federica Mogherini, is visiting the Western Balkans at a time when ethnic and politician tensions are undermining the European integration process. Read more. A once-warm welcome is turning tepid for a Syrian refugee family in Bulgaria. Read the full story. Young programmers in Bosnia hope they can help to relieve stress-related illness at the same time as brightening their own prospects amid high national levels of unemployment. Read more. The bridge across the river dividing the Kosovo town of Mitrovica into ethnic Albanian and Serb areas is being reopened, but its history as a focus for tensions means locals are wary about expecting progress. Read more. Ahead of an important court verdict on abortion in Croatia, the discussion of the topic in medical faculties seems weighted in favour of opponents. Read more. Romania has seen a spike in social engagement with waves of protests engulfing the country in recent years. Read more. Kosovo Assembly Speaker, Kadri Veseli, said on Thursday that the demarcation with Montenegro, which is being rejected by opposition parties, will be proceeded to the assembly next week, Kosovo outlet Insajderi reports. “We have excellent relations with Montenegro and next week the Assembly will discuss ratification of the border Agreement,” Italian news agency Ansamed.info quotes Veseli as saying. In his addressing Veseli said: "The demarcation has no alternative but to ratify in the Assembly." Russian prosecutors are reviewing a request by Montenegro to help the Balkan nation investigate an alleged coup attempt during elections in October, the TASS news agency reported on Thursday. The Kremlin has dismissed claims the Montenegro's special proescutor, Milivoje Katnic, that Russia was involved in an alleged plot to assassinate the then Montenegrin Prime Milo Djukanovic and bring an opposition alliance to power. "The Prosecutor General's Office of the Russian Federation is reviewing the request of the authorities of Montenegro for rendering legal aid in connection with the investigation of mentioned events," TASS said, citing a statement from the prosecutor's office. Head of the IMF Mission for Serbia James Roaf told NIN weekly on Thursday that incomes in Serbia are "painfully low by western European standards" and in order for that to change, economic growth needs to be significantly faster than three per cent, Beta news agency reported. Roaf said that Serbia's public debt, which exceeds 70 per cent of GDP, is still high and sensitive to changes in external conditions or to economic downturn. He added that the economic programme Serbia implemented with the support of the IMF has exceeded all expectations in terms of economic growth, investment, employment and fiscal adjustment. "Success in the long term, however, will depend on the successful completion of structural reforms," Roaf said. The Higher Public Prosecutor's Office in Belgrade confirmed on Thursday that it has sent Marija Mali, the former wife of Belgrade mayor Sinisa Mali, an invitation to give a statement regarding her recent allegations against the Serbian Anti-Corruption Agency among others, N1 television reported. The invitation comes after she told NIN weekly that she is ready to name the company which was involved in the nocturnal demolitions in Belgrade’s waterside Savamala district in April last year, and claimed that her ex-husband hid part of his assets from the anti-corruption agency. On February 13, the Network for Investigating Crime and Corruption, KRIK, published an interview with Marija Mali in which she claimed that her ex-husband had organised the demolitions so that the government-backed Belgrade Waterfront development project could continue being built. The Croatian Constitutional Court rejected on Thursday a plea for abolishing the 1978 Law on Medical Procedures in a landmark verdict that has ensured women’s right to an abortion in the country. The Christian NGO, the Croatian Movement for Life and Family, who filed the plea back in 1991, claimed that the law is unconstitutional as it breaches the right to life, but the court disagreed, taking the international treatment of women's reproductive rights into account. However, the court urged the parliament to pass a new Law on Medical Procedures, which would be completely in line with the constitution, within the next two years. At a meeting with Bulgarian companies on Thursday, US ambassador to Bulgaria Eric Rubin said he would try everything possible to arrange for US President Donald Trump to visit the Balkan country, the Bulgarian National Radio reported. At the same time, Rubin made it clear that Bulgaria cannot expect the US to lift its visa requirements for Bulgarian nationals any time soon. The European Parliament adopted a resolution on Thursday, calling on the European Commission to reimpose visas for US citizens over America's failure to lift visa requirements for nationals of Bulgaria, Romania, Croatia, Poland and Cyprus. 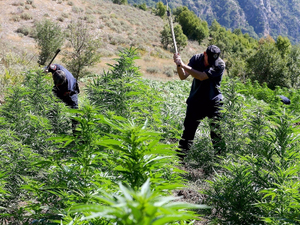 The Albanian government will create a special task force to tackle widespread cannabis cultivation in the country under a new national strategy that will be created as part of Albania’s war on drugs. Deputy Prime Minister Niko Peleshi is going to lead the task force, while all other ministers will also be fully engaged in the fight. Up to now, only the state police were tasked with tackling the issue on the ground.